Cadence Design Systems, Inc. today announced that OrCAD® Capture now provides export capability for Intel Schematic Connectivity Format (ISCF), targeted at automating Intel-based design reviews. Arrow Electronics (NYSE: ARW) and Cadence Design Systems, Inc. (NASDAQ: CDNS) today announced a collaboration that will bring integrated design tools to engineers, helping them accelerate the pace of new product development and get products to market faster and cheaper. Cadence to show latest OrCAD innovations for PCB design and data management. Five new OrCAD® products and three key feature updates as it celebrates 30 years of continued OrCAD design and innovation. The latest OrCAD® / PSpice 16.6 release and recent Quarterly Incremental Releases provide significant new enhancements and capabilities in the areas of usability, speed, convergence, and performance. New additions to OrCAD® product line to accelerate the mainstream PCB design process and provide a significant boost to productivity and efficiency. 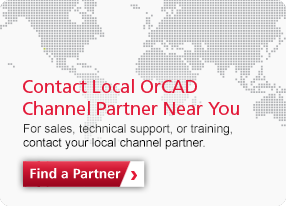 Join Cadence Channel Partner EMA Design Automation as they cover the latest advancements in component data management for OrCAD.